Today I remember my own dad, who passed when I was 13 years old. I have missed him ever since. My dad was a holocaust survivor, I have no words to describe the pain that he endured at the hands of Nazi Germany. He spent 5 years in the hells of concentration camps. He was the only survivor out of his entire family. He was married before the war and his wife and two small children perished in the hells of the holocaust. And yet somehow he managed to survive, to go on, to have a new family, to work hard so I and my brother could have what he never did. My father was a mover and a shaker, he could move mountains, people always came to him for help and he always somehow managed to give them what they needed. From the moment he was liberated all he wanted to do was come to the United States, where he could live without the fear of another war, another holocaust, but that never happened for him. Today I celebrate him and his dream for me. Wishing all Fathers a Happy Blessed Father’s Day!!! 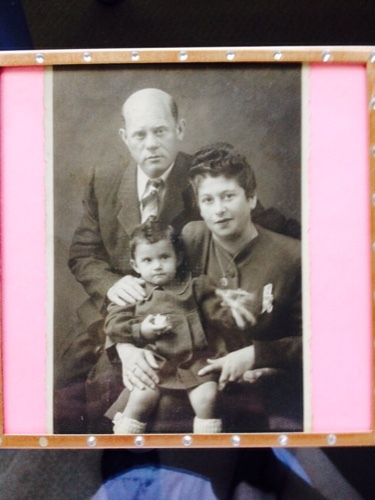 In the picture, my mother, my father and me at 18 months old while still in Germany right before we left for Israel. How are you celebrating your Father? Post your favorite Father picture, love to hear from you. Thank you Anne, I am still crying, this is so deep for me, thank you for your encouraging words they mean a lot to me. Ina, I am so grateful for your comment. It’s not easy for me to speak of my parents and the holocaust, it’s so emotional. But knowing that I am able to light the way for you makes it all worth it. Blessings. Masha, this is a lovely way to remember your dad. What an amazing man indeed to have as your father, must have been so strong and real survivor. Everyday’ has been Father’s Day at the moment and we celebrate every moment he’s with us! Dal, thank you for your beautiful words. Blessings dear. Claire thank you, my fathers hopes and dreams are alive with me, thank you for your kind words and insight. Blessings. Vivian of course I remember you. You are so right we all need examples of courage and strength. Thank you for your kind words, they mean a lot to me.